“The practice of meditation [is] the key to the development of true piety and synonymous with walking with Christ throughout the day” (102). 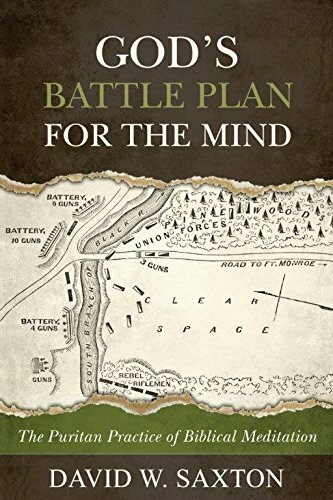 Instead of excavating outdated modes of Puritan spiritual tradition, David W. Saxton reveals an exercise suitable to Christians today in his book, God’s Battle Plan for the Mind; The Puritan Practice of Biblical Meditation (hereafter Biblical Meditation). Equating meditation with “the doctrine of Christian thinking” (2), Saxton gives the following definition for meditation: “to think personally, practically, seriously, and earnestly on how the truth of God’s Word should look in life” (2). Extensive Puritan quotes are strewn throughout the chapters, woven by Saxton into an exposition of Puritan thought, as well as a commendation for current Christian practice. Biblical Meditation unpacks how the Puritans understood, implemented, and benefited from this “duty by which all other duties are improved” (12). Biblical Meditation dedicates its opening chapters to general Puritan observations regarding meditation’s importance, Biblical and non-Biblical practices, and the two common forms of meditation (occasional and deliberate). Saxton then expounds specific Puritan habit, with chapters concerning the steps to effective meditation (Ch.6), what subjects to meditate upon (Ch. 8), and the benefit of constant meditation (Ch. 10). Structurally, Biblical Meditation moves from general to specific with appreciative meticulousness, yet also the unfortunate effect of slight repetition in both quotation and application. Rather than a dusty tome documenting former Christian convictions, Biblical Meditation strikes the readers heart. Saxton unveils a practice he considers misunderstood and ignored by Christians today, much to their detriment. Pinpointing today’s Christian as those lacking meditative habits, Saxton develops an impressive argument from the Puritan perspective to remedy this deficiency. This sentiment and purpose seems shared by Saxton’s Puritan authors and preachers, considering the extensive writing devoted to the subject of meditation. Although one would have a hard time arguing against meditation on God’s word, there are a few contentious aspects to Biblical Meditation. The church of today is continuously presented as failing in meditative practice, with no supportive evidence, while the Puritan authors are shown to have no meditative foibles. Areas in which Puritan practices begin to look pharisaical (Nathanael Ranew’s twenty reasons to meditate and the steps by step instructions found on every aspect of meditation from multiple Puritan authors comes to mind) are quickly passed over with a mention of their underlying good intent. While such objectives may be true, blithely painting Puritan practices as perfectly godly calls into question Saxton’s objectivity. Biblical Meditation presents a cohesive, persuasive look at the Puritan practice of meditation, a practice uniting heart and mind to “wholeheartedly integrate doctrine with living” (1). Godly men set an example of meditation, and Saxton encourages the Christian today to follow in their footsteps.